1.) The existing Purple Route will be extended about one quarter mile farther south to Fort Avenue. This long overdue connection will serve many of the smaller, local businesses that operate on and around Fort Avenue. 2.) The Banner Route begins service and, despite the contested path the Banner Route will take, there will only be about half a mile between the two routes that serve Fort avenue. Basically, no business on Fort Avenue will be more than one quarter of a mile from a Charm City Circulator Stop. With the addition of the Banner Route and the extension of the purple route, the Circulator will actually begin to resemble its own small transit network. The new Banner Route and the addition to the existing Purple Route figure to attract even more riders to Baltimore’s fledgling transit system. Even without any changes, ridership climbed again between March and April. In fact, as of April 18th, the Circulator celebrated its five millionth rider. The system notched its four millionth rider in mid-January. So, over the past three months, the Circulator has transported 1 million riders. Not too bad for a system paid for by a parking tax and some grant money. The Charm City Circulator‘s ridership numbers have been increasing steadily for over a year. This should come as no surprise to those who live or work near its routes. What may come as a surprise is that Baltimore City is actually responsible for a successful transit program. As of March 2012, the Circulator transported about 350,000 per month. This may not seem like a huge number of riders but consider that in March of 2011, the Circulator transported only 188,000 riders per month. Transit use is increasing rapidly across the U.S., but very few municipalities can boast an 83% ridership increase over the course of one year*. There are many causes of this downtown Baltimore transit renaissance. First, the bus service is free, eliminating almost every disincentive to ride. Second, the service is local, not regional, making it highly functional for people making short trips within the Circulators target area. Third, two of the three routes serve the 401, the City’s central business district, currently the fastest growing in terms of residential population. Perhaps most importantly, the Circulator serves people going to and from jobs, stores, businesses, homes and apartments, not parking lots in the suburbs. Every Circulator stop serves a neighborhood, not a park and ride. And, the Circulator is expanding, serving even more neighborhoods and job centers, including Fells Point and Hopkins Hospital. As a result, one can expect ridership to increase even more. In fact, since the Green Route, the newest Circulator route, first began operating in November of 2011, overall circulator ridership has been increasing even more rapidly. The Circulator is also a small operation. The Circulator is able to run efficiently because its routes are short and the Baltimore City Department of Transportation isn’t trying to do too much. Fewer routes in this case means higher performing routes and, in this case, consistent growth in ridership numbers. It also means that the Baltimore City Department of Transportation can spend time finding funding sources to add new routes to the Circulator. The Banner Route, for example, was made possible, in part, by a $1.6 million grant from the U.S. Department of Transportation. Meanwhile, even if the MTA were able to get such a grant from the Federal Government, $1.6 million would probably not be enough money to fund a new route. Courtesy of Baltimore City, a map showing the new Banner Route in blue. The Circulator isn’t just one new bus route though: it has grown from one route carrying about 1,200 passengers a day into a three-route system carrying over 11,000 in under two and a half years. With the opening of the Banner route this June, expect ridership to continue to grow rapidly as residents, commuters and tourists gain access to Locust Point and Fort McHenry. Even though the Circulator doesn’t cover nearly the area that the MTA does, its ability to make the most of very little is impressive and begs the question: isn’t it time Baltimore had its own centralized transit authority? Baltimore is currently the largest city in the U.S to have a state-run transit agency. The effects of the bureaucracy and thinly spread resources can be seen in the piece-meal way that Baltimore’s transit system was built, in the lack of comprehensive planning and in the lack of regional cohesion around a transit-oriented vision. A map of the MARC Train system: The State of Maryland currently operates MARC Service in 12 counties within Maryland and 2 separate jurisdictions including the District of Columbia and West Virginia. MARC, similar to NJ Transit, is a perfect example of the sort of regional transportation resource a state should provide. The Light Rail, however, which operates much more locally within Baltimore and Anne Arundel Counties and Baltimore City serves a different purpose entirely, one more consistent with the goals of a regional transit authority. *If anyone is interested in taking a look at the data set or the data sources, as always, feel free to comment below and I’ll put it up. When the real estate bubble burst, it left millions of homes and businesses underwater. 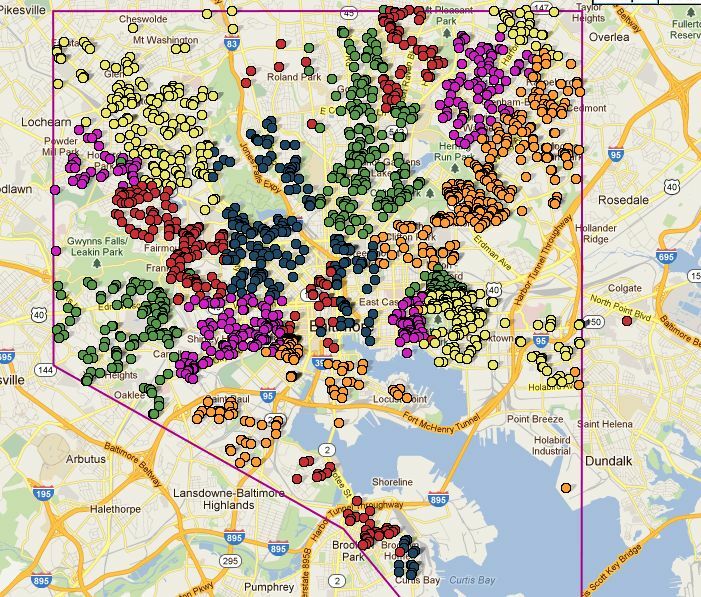 Baltimore is no stranger to this phenomenon: over 20,000 homes have been foreclosed upon in the last five years. With communities across the country still feeling the effects of the foreclosures and lost jobs, a new study is showing how we can make the best of a bad situation. The Red Fields to Green Fields research effort is attempting to document the effects of taking “red fields”, properties with zero or negative property value, and turning them into “green fields”, public or quasi-public green spaces. So far the study has taken a look at six cities: Atlanta, Philadelphia, Cleveland, Miami, Denver and Wilmington, DE. Each city has its own unique issues but each sees red field to green field conversion as an opportunity and each has something in common with Baltimore. 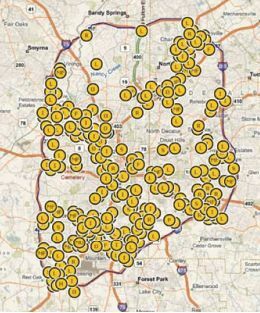 Atlanta has one of the lowest parkland acreage to population ratios of any large city in the U.S. and hopes to change that by converting 2,850 acres of vacant land inside I-285 into parks. Meanwhile, in suburban Atlanta, 13,000 acres of available land will be removed from the market to create green space, strengthening the real estate market and communities. Cleveland is focusing some of its efforts on improving water quality. Cleveland’s red field plans involve taking some formerly occupied land and using it to implement neighborhood-scale solutions such as a small wetland or park. Proposals also recommend increasing the amount of vegetation along stream corridors draining into Lake Erie. 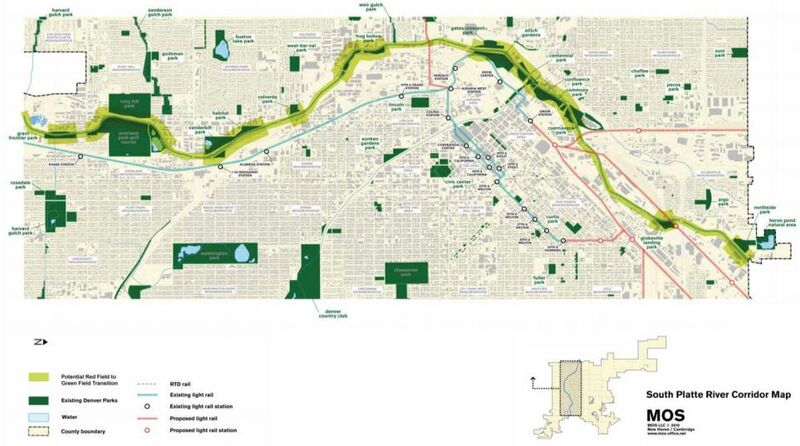 Denver and Miami are putting a lot of effort and money into creating parks near proposed and existing rail stations. It seems that governments have realized that, in order for Transit Oriented Development (TOD) to be successful, new development must have access to parkland as well as transit. 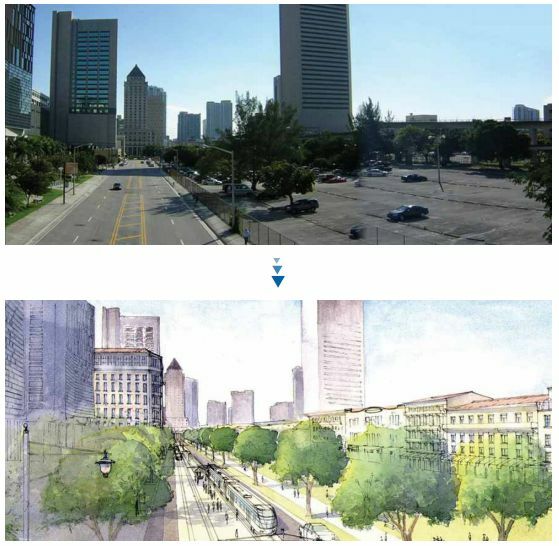 Miami, on the other hand, sees Transit Oriented Parks as potential centers for new neighborhoods and as a way to increase transit ridership by making the area around the station more livable. 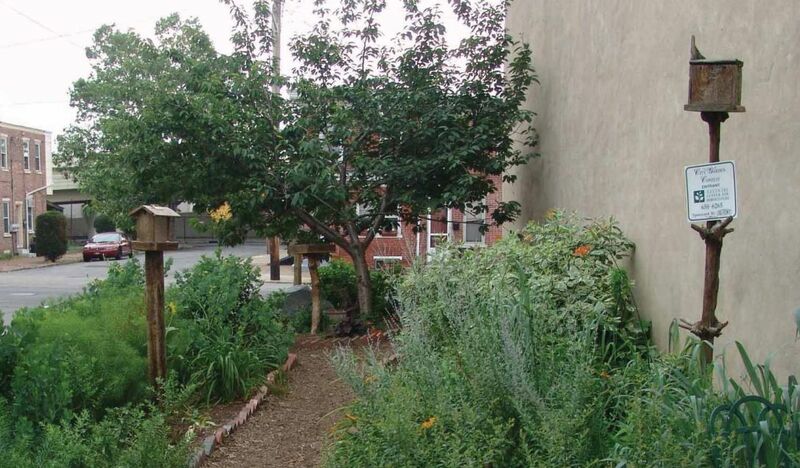 Philadelphia is taking a look at the inequity in available green space. Some neighborhoods have access to wonderful parks while others are entirely without access. Many of the areas without access to parks are also areas with an excess of vacant land. Wilmington has perhaps the most interesting and relevant proposals. The city is faced with neighborhoods facing shortages of green space and large scale abandonment and vacancy problems. Each of these issues contributes to a cycle of disinvestment and a continued decrease in property values (sound familiar, Baltimoreans?). Wilmington intends to remove blighted and vacant properties from the real estate market and, more importantly, the neighborhood. By converting these properties into “pocket parks”, the neighborhoods would, ideally, begin to stabilize themselves. Perhaps what’s most intriguing about Wilmington’s plan is its small scale and neighborhood-level impact. Wilmington’s approach is only estimated to cost about $22 million; the other proposals, however, are estimated to cost over $1 billion and some will cost much more than that. Baltimore is not a city rolling in cash and, therefore, the small solutions may work best here. That said, there’s something Baltimore can learn from each of the proposals above. 1.) From Atlanta – a row house does not need to remain a row house. Analysis of the supply and demand in a neighborhood would likely show the need for more demolition and open space conversion. 2.) From Cleveland – converting small parcels into natural areas can make a difference in water quality. Baltimore’s Inner Harbor suffers from terrible water quality while the City has an overabundance of vacant properties, there’s a solution in the making here. 3.) From Denver – transit isn’t everything to TOD. Developments planned around Baltimore’s proposed Red Line must have access to parks as well as transit. 4.) From Miami – surrounding transit centers with parkland can be a great way of reinforcing a neighborhood’s center and increasing transit ridership. 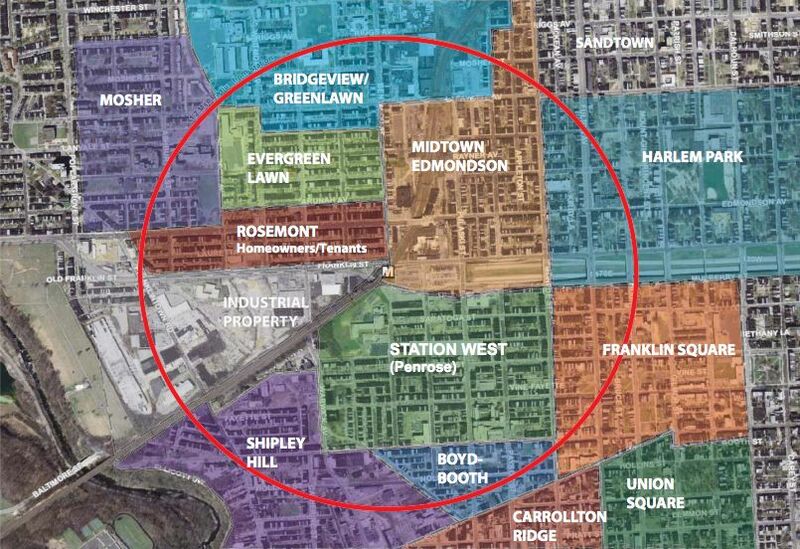 Creating nodes where transit and parkland intersect could create vibrant neighborhoods. 5.) 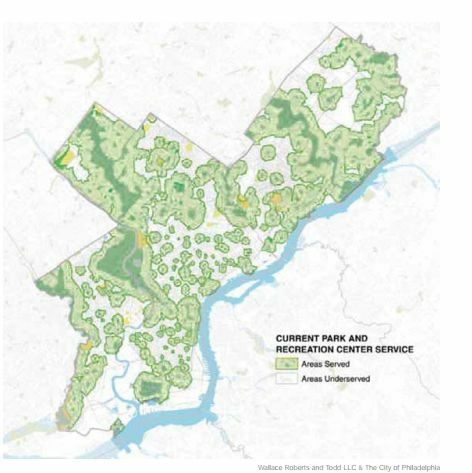 From Philadelphia – equal access to green space is more important than having more or larger parks. Greenways and small open spaces are great ways to ensure that everyone has access to a park. 6.) From Wilmington – low cost, neighborhood level solutions can be an effective revitalization technique. Sometimes the large-scale solutions intimidate Baltimore. Well, sometimes a small park in the right place can change a whole block. Put it on a corner, and it could change two blocks. Baltimore should make the most of its vacant properties and use them as instruments for neighborhood revitalization. A map of the BWI trail which will be extended north to the Nursery Road Light Rail Station. Many of the projects receiving funding aim to make transit more bike-accessible and, in effect, would make the City’s often disconnected neighborhoods more accessible to one another. The fact that Maryland is investing money in Bicycle infrastructure is great news, especially in Baltimore, where a number of well-designed bikeways could make a huge difference. In fact, evidence suggests that bike-able cities can experience drops in crime. Lower crime numbers and a more bike-able, transit accessible city could be in Baltimore’s future. There are so many transit projects worthy of funding; not just in Baltimore, but around the country, municipalities are struggling to balance their budgets while some of the more basic needs such as access to reliable public transportation remain unmet. Below is a wish list of the top 5 transit and infrastructure projects Baltimore should work towards. This is not a comprehensive list, just a few suggestions. 1.) A simple connection between the southbound Light Rail and Penn Station. It makes no sense that Penn Station wasn’t included on the original Light Rail line and why, when they added a Penn Station connection, they only added it for trains heading south out of the station. It’s past time this situation was rectified and travelers could connect directly to Penn Station from the North. 2.) The Red Line. While I don’t fully agree with the route, an east-west transit connection is sorely needed. 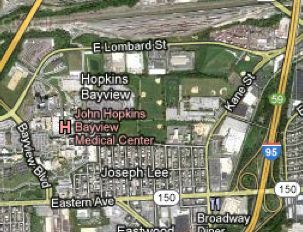 In addition, there are some great opportunities to connect MARC commuter rail to the Red Line at two points along its path: West Baltimore and Hopkins’ Bayview Campus. The West Baltimore MARC station is an existing station and, under the current proposal, would be part of a larger redevelopment effort aimed at making the area transit accessible. 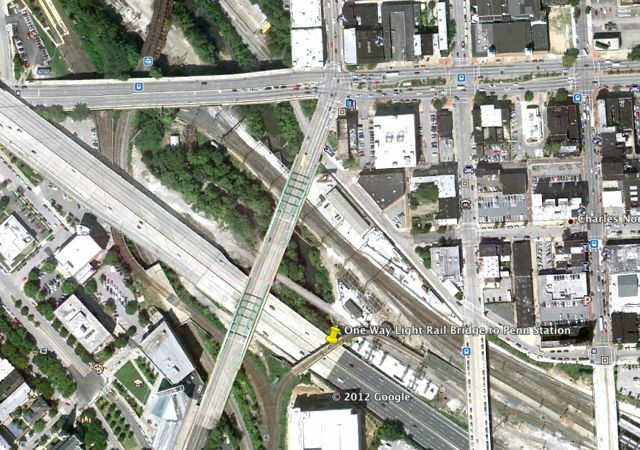 Courtesy of the Baltimore Department of Planning, this is a map of the area surrounding the West Baltimore MARC station. A connection between the Red Line and MARC would be part of a larger revitalization effort. The Bayview stop would be a new stop and should help provide a transit anchor in that area. The area is currently without too much in the way of public transit despite the fact that the MARC Penn Line runs very close to Bayview. An aerial view of Hopkins' Bayview Campus shows the MARC Penn Line running through the northernmost section of the screen without a station stop. 3.) A new downtown transit hub: several sites could be used but the one that makes the most sense is the current location of the 1st Mariner Arena. As is noted in an op-ed in The Baltimore Sun, the 1st Mariner site would sit at the intersection of the existing light rail line and the proposed Red Line. The site could play host to retail, apartments and offices. It could also serve regional bus operators such as Greyhound and potentially a MARC station if CSX should ever expand or sell its right of way to the Howard Street Tunnel. This project presents tremendous opportunity for an area that needs a little push through this recession. 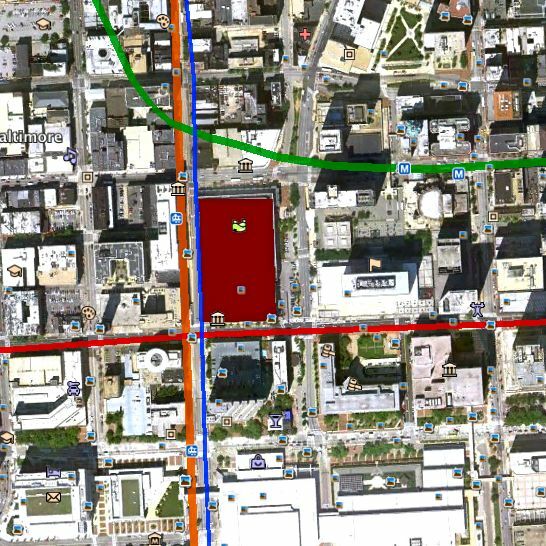 It should also be noted that the Lexington Market Metro and Charles Center Metro stops are only a few blocks away and an underground connection could be built to allow for transfer between all three transit lines. It should go without saying that this building should include a “fare only” area to allow for smooth transfers between MTA lines and prevent fare evasion. A connection between all transit lines would be a real boon to Baltimore. 4.) 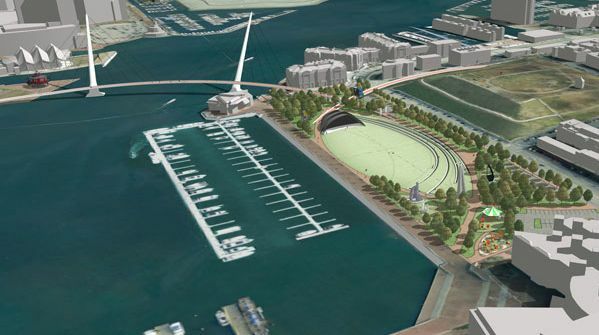 A pedestrian bridge connecting Rash Field and Federal Hill with Harbor East was proposed as part of the redevelopment of Rash Field, which has been planned for quite some time. The bridge would not only cut off a significant distance for pedestrians and cyclists trying to cross between sides of the harbor but could also be an iconic addition to the City’s skyline. If Baltimore were a bit more ambitious and had a bit more vision, added width and carrying capacity could be included in the bridge design so that it would actually be able to hold MTA buses (and ONLY MTA buses) and potentially even a light rail (see item 5). Providing such a shortcut to mass transit users would allow the MTA to actually compete with and ideally beat out automotive use for short trips around Downtown Baltimore. There is one complication with such a bridge: it must be high enough to allow tall ships to pass through for infrequent albeit important visits to the Inner Harbor. As a potential solution to this problem: the Greater Baltimore Committee has proposed a bridge that would swing open like a gate- if the bridge were to be used for buses or rail transit as well, this option would likely be infeasible making a traditional drawbridge the more likely option. 5.) A new transit line. There are a few options here, none of them even close to being a reality. After all, this is a wish list. A new transit line should essentially parallel the current Light Rail line, connecting Penn Station with City Hall. Connections with the Shot Tower Metro and, eventually, the Red Line at Harbor East are also options. Connections to existing the Metro and proposed Red Line were the key criteria for determining this route. After all, connections are what make a transit system effective. Cost and ease of construction were also taken into account. 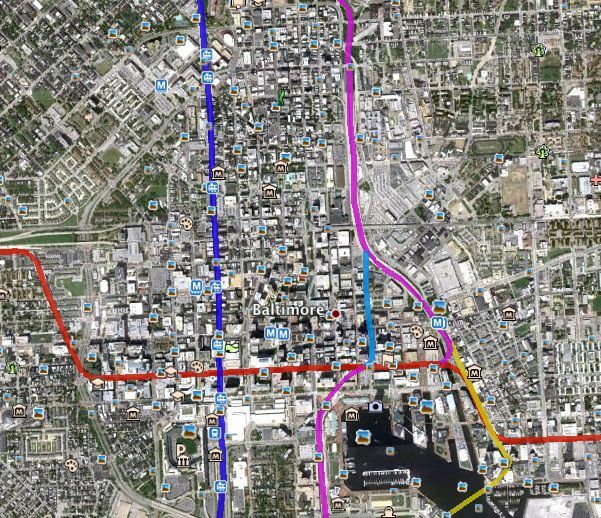 The purple, light blue and yellow lines represent several potential options for new transit corridors serving Downtown Baltimore. The red and dark blue lines show the red and light rail lines, respectively. The purple, yellow and light blue lines each offer different advantages and disadvantages. The purple option is perhaps the most reasonable so its path is the dominant one, meaning the other lines should be assumed to continue upon its route except where they diverge. Each route would use the the right of way created by the southernmost, elevated portion of Interstate 83 (trains would travel under the highway which is currently used as municipal parking). The lines diverge toward the end of 83 where the median of President Street, the Red Line tunnel through downtown, the median of Light Street and Holliday Street represent different possible alignments. The yellow route would take advantage if item number 4 (see above), a pedestrian and transit bridge, is built. These routes are far from a reality but could be a part of the larger regional plan. In fact, the Baltimore Rail Plan calls for the construction of a similar line connecting Towson, Towson University, Hopkins Undergraduate Campus and Penn Station to Charles Center and the Inner Harbor and converging with the existing light rail at Camden Yards. It may seem a bit far off but the downtown, elevated portion of I83 is to be redesigned, reinforced or destroyed in 2020. Whatever happens to that section of highway, a transit line should be included. Is Rapid Bus Transit right for Baltimore? Visualize, if you can, a bus system that operates like a subway in a smaller city such as Boston or Washington. Baltimore does not currently have the resources to construct such a subway but innovative cities make the best of what they have. Baltimore should think outside the box of conventional mass transit much the way that Bogota, Colombia did. In Bogota, on several of the city’s larger avenues, medians have been converted into rapid transit bus lanes with stations and platforms much like those on a subway allowing people to prepay rather than wait in line and pay individually. The system, known as the TransMilenio, not only removes buses from the traffic pattern but also moves people around the city quickly and efficiently, as buses run on their own right of way. The advantages of such a system include many of the efficiencies of a mass transit line without much of the expensive infrastructure. There are, of course, criticisms of Rapid Bus Transit; for example, without linking a new line to a larger, more cohesive system, it may not make sense for Baltimore’s commuters to leave their cars at home. In fact, Baltimore’s population may not even be dense enough to support such a system. Of course the paradox is that, in order to make such density a possibility, infrastructure must be built to support it. A map of Bogota's TransMilenio System. The TransMilenio's many connecting and far-reaching lines resemble those of a subway system and increase the system's overall effectiveness. If Baltimore intends to increase its population and make increased density a part of that plan, perhaps rapid bus lines are the cheapest way to go about that. The City could plan routes in order to target certain areas for redevelopment and strengthen the efforts of some struggling neighborhoods to stay competitive with the rest of the City. Of course, the longer term advantages are that if the routes are successful, the rights of way used for bus transit can be converted into light rail or streetcar routes or the buses can be electrified in order to remove emissions from the equation. The question becomes, if this is something Baltimore should consider where should these routes go? Baltimore is an old city with narrow streets few of which can accommodate the traffic they currently carry let alone a bus only lane. However, one possibility is a route that parallels the future Red Line. This option would allow Baltimore and the State of Maryland to get a sense of daily ridership potential and work out some of the kinks prior to initiating a large-scale construction project. And, if funding falls through for the Red Line, at least Baltimore would be left with an east-west transit option. If all goes well, maybe we could see more rapid bus lines put in place along other important corridors.